It was a great year leading the Mull Eagle Watch trips, watching the white-tailed eagles at the nest, but it is even more special when the eagles visit me. 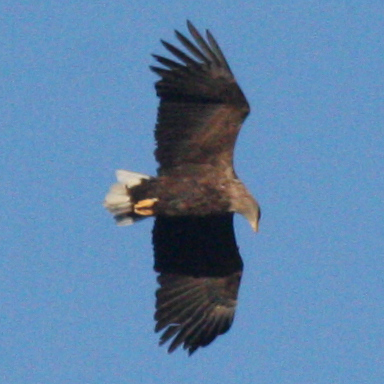 When I was out in the garden the other day a large shadow flashed across the ground, and on looking up into the sky I saw a pair of white-tailed eagles soaring overhead. Without a single flap of the wings they circled above the house, and I could almost see the glint in their sunlit eye as they stared down at me. I was transfixed. Their long primary feathers flexed as subtle changes in direction caused the air currents to ruffle the pale plumage on their heads. One was a certain adult, with a pure white, wedge-shaped tail. The other retained narrow brown bands around the tail feather margins. Not a pair I recognize, certainly not Iona and Fingal from the Glen Seilisteir nest. Perhaps we have a new pair setting up territory in the neighbourhood. The large sessile oaks among the deciduous woodland on the steep seashore opposite our front windows would be a nice site (for them and us). The large sitka spruce in the garden is probably too much to hope for (the bird table probably isn't strong enough either).. I watch them circling, watching me, for about 10 minutes until with a subtle adjustment of wing angle the older bird heads off east, followed by its partner, and within 20 seconds they are just distant specks above Ardchrishnish They soar above the higher ground for a few moments before descending steeply to disappear down toward the coast where there may be some carrion on the shore. Loch Scridain is always rich in food for the eagles. There are plentiful fish and seabirds and at this time of year there are usually a few carcases of grey seal pups that didn't survive the storms that usually occur in November. It was great to be able to spend a few minutes admiring these magnificent birds that add so much to the wildlife fauna of Mull and attract so many visitors to the island. i look forward to next year and hope that the Glen Seilisdeir pair survive the winter and return to their nest for a successful breeding season in 2014.